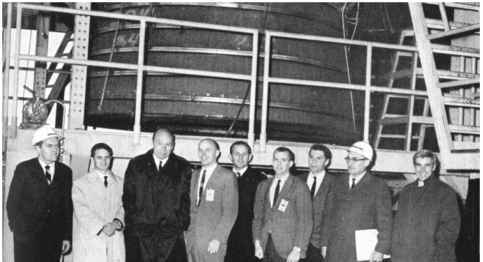 The seven astronauts (without hard hats) stand in front of a mighty Saturn F-1 engine while touring the Marshall Space Flight Center. Areas covered during the initial orientation and academic training included an introduction to NASA, field trips and briefings on the three NASA centres dealing primarily with manned space flight, and detailed briefings and demonstrations of the functions of all the major divisions within the Manned Spacecraft Center in Houston. Every day, all eleven men would be collected by the longest limousine they had ever seen and driven to specific buildings or facilities, where they would sit through a talk given by a division head, usually accompanied by a lengthy slide show to complement the oral presentation. 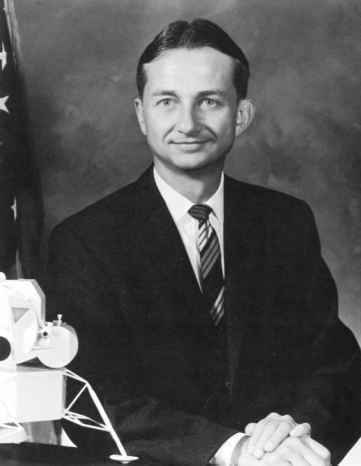 Apollo spacecraft systems briefings, Saturn launch vehicle systems and operations briefings. 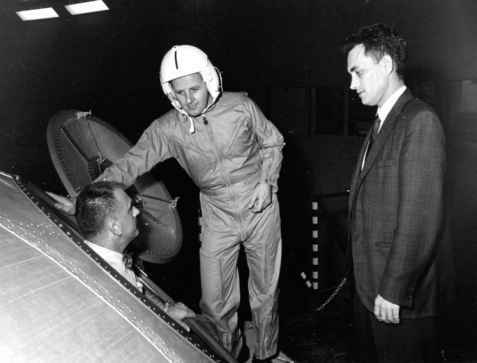 As with their more formal training, the eleven men were encouraged to hold individual conversations and group discussions with instructors, managers, other astronauts, scientists and engineers. This informal approach outside of the classroom or laboratory environment was greatly appreciated, and would contribute tremendously to the men's education and development. In order to simulate accelerations associated with launch, launch abort, orbital reentry and lunar re-entry, several of the scientists would train on a centrifuge, more formally known as the Aviation Medical Acceleration Laboratory, located at the Naval Air Development Center in Johnsville, Pennsylvania. However Bill Thornton, for one, does not recall being involved in this particular aspect of his astronaut training. The interior of the centrifuge's gondola could be configured to simulate a cockpit inside an actual spacecraft, and the engineers at the facility could install internal mock-ups of different spacecraft from the Mercury, Gemini and Apollo series into the cab. These cabs sat on long arms attached to a giant motor, weighing 180 tons, which swung the cab around at the end of the arm at tremendous speeds, accelerating from zero to 180 miles per hour in just seven seconds, sufficient to exert 40 G on the occupant. While the scientists and their astronaut colleagues trained at speeds and pressures far less than this, they found that a force of just 2-3 G produced only slight limitations to their performance, while 9-10 G was enough to cause a total inability to move or talk, and only a limited ability to breathe. They would later train on another centrifuge gondola in the Flight Acceleration Facility in Building 29 at the Manned Spacecraft Center in Houston.